Another thinly disguised excuse to write about a car that I like and used to own (yes, another one). This is my singular experience of going Italian, and very gratifying it was too. And, reliable. I remember falling in love with the FIAT Cinquecento Sporting at first sight (and read, it was an article in Car – by Andrew Frankel, I think – entitled “Eeenie Weenie, Teenie Weenie, Yellow Hotted Up Machinie”, or something very similar). The little FIAT had everything I liked at the time.It was small, chunky, smart, with just enough ‘tough’ about it (almost entirely down to slightly lowered suspension and a set of 1” larger and wider alloys and tyres), and came in a beautifully bright and cheery yellow. I was in my mid-twenties (sigh! ), just married (sweet sigh! ), and had just been paid my first bonus at work. So, I had just enough spare in the account – in terms of goodwill with my lovely wife, and cash in the bank – to zip down to a FIAT dealership and order one in Broom Yellow (as it was named in the UK) with a sunroof (a factory fitted, pop-up one). It may seem incredible today, and FIAT must look back on such things with great fondness, but I had to wait about 4 months for my car to be built (at Tychy) and delivered, such was the demand across Europe for this beguiling little car. I also had to pay full list price: £6,200 with that roof, from memory, which sounds quite a lot given it was over 20 years ago. I bought it without having test-driven a car in Sporting spec, so newly introduced was the model to the UK (at the end of 1994), but I did have a go in the standard, 903cc-engined car, which was significantly inferior in the engine and gearbox department, but was still quite charming enough not to put me off. When the car finally arrived, I was not disappointed. The cheeky little yellow FIAT replaced a Honda Integra EX16, which had a terrible chassis, a wonderful engine, and a bright blue interior. Maybe it was all relative, but the FIAT’s chassis felt fantastic: taut, beautifully planted on the road, with a well- controlled ride for a car with such a short wheelbase – although understeer was still quite pronounced. Steering was heavy (unassisted), direct, and absolutely full of feel; the wheel itself was two-spoked, leather bound, and air-bag-less. The 1,104cc, fuel injected, 54BHP, ‘FIRE’ engine was very willing, buzzy, and frugal when not being thrashed. The 5-speed gearbox was precise if a little chunky in its action, worked via quite a long lever topped by a lovely, slightly oversized, leather-bound gear knob. This was a modern, more practical, slightly less characterful and involving Italian take on the Mini Cooper – which is almost precisely how Clarkson described it in a comparison test he hosted for ‘old’ Top Gear. The interior was great fun in a less-is-more kind of way. The doors had exposed, painted metal surrounds (the yellow really helped here and, accidentally, reflected the Coupé FIAT’s much admired, more knowingly adorned interior), cloth door-cards, electric windows (the switches were actually dash-mounted next to the radio cassette head, part hidden behind the steering wheel) and manual interior adjusters for the wing mirrors. Sporty front seats, in a nicely-but-quite-discretely sporty charcoal and mid grey with red and thin yellow striped cloth, completed the picture. Oh, not forgetting the MG-a-like red seat belts. The otherwise standard dash was one of those stepped and layered FIAT designs of the time, reflecting a trend started with the original, IDEA designed, Tipo. It was finished in laughably hard black plastic, that proved pretty robust, and featured simple sliding controls – capped with what looked like tiny, up-ended plastic cup-cake cases – for the surprisingly effective heating and ventilation. There was no glovebox, but a slidey-surfaced shelf across most of the dashboard. A radio-cassette sat impressive-looking in its midst, but flattered to deceive as two pathetically tinny speakers sitting at either end of the dash-panel proved incapable of cashing the cheques that the fascia-panel was writing. Space was impressive for such a small car, helped by high mounted front seats that slid as well as tipped forward for easy access to the rear. I once had 4 adults, a dog, and weekend luggage for us all (the dog did travel light, admittedly) ensconced for a 300 mile round trip to Stoke, and although it was a little noisy in there, we were snugly comfortable enough. Thinking about the exterior styling, the styling mods for the Sporting were remarkably few but effective. As mentioned above, the chunky 4-spoke alloys set the tone, but the most notable feature was the asymmetric (driver’s side) air-inlet, trimmed by black plastic, on the leading edge of the front bumper, which echoed Abarth 500s of old. Together with a liquorish strip of trim that went around the corners of the front and all the way around the rear bumpers, the contrast with the yellow paint worked really nicely. There was no rear spoiler of any kind, and only body colour plastic wing mirror caps, a red enamelled ‘Sporting’ badge and an oval-shaped exhaust baffle changed the basic formula. To my recollection, the styling was that of IDEA – like the Tipo – but ‘Honest John’ names Giugiaro (no less) as the designer, and I read somewhere else it was a Centro Stile job (?) Whatever, the styling was upright, narrow, very simple in terms of panel shapes and feature-lines, had nicely defined wheel arches and was quite similar from some angles to the earlier, iconic, Lancia Y10. It was functionally cute, with only the harsh rectangular black door handles (the action of which was quite awful) and a low set fuel filler flap jarring the eye. The overall effect was much greater than the sum of its parts. Of all the cars I have owned, this is the one that has drawn the most positive reaction. People of ever age, race, gender and creed just loved it. I’d have gatherings at petrol stations, neighbours wondering over to have a smiley word about it, pedestrians turn and point and smile as I drove past … the effect was wonderful. Equally, driving it and also being a passenger caused deep joy. I used to look forward to – and found a grin for – every journey. I sold it to make way for a company car; a Volcano (orange) MGF VVC, no less – those were the days – which was actually less than the sum of its parts and so quite the opposite of the cheery, spunky FIAT. I wish I had kept it longer, and you don’t see many nowadays. The Cinquecento was replaced by the Seicento, which was very obviously based on the earlier car, but which managed to do nothing for me whatsoever. Strange. Oh yes. 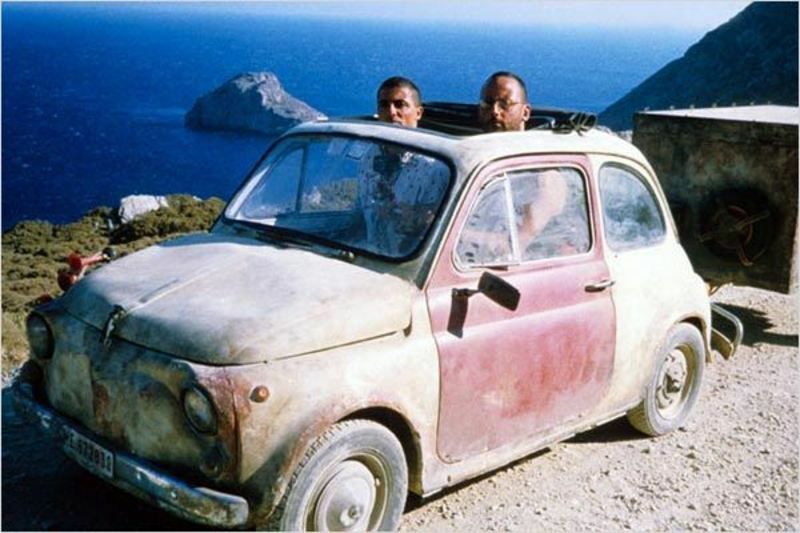 The ‘film’ connection is that a yellow Cinquecento featured, mainly as a joke, latterly in “The Inbetweeners”. It is oft-mistaken to be a Sporting, but isn’t, and actually confuses me because Broom Yellow was never offered on the standard car. It was also made out to be a ‘Hawaii’ Special Edition, which was another piece of fiction. I can’t help but lament at this treatment of a small gem of a car and it is, for me, one of the least likeable pieces of casting of a car in a movie. Thanks for that: that car created a lot of buzz and positive reactions. The lesson I draw is that good looks and good controls and fun handing matter more than tech and power. Great fun! Thanks for the memories. It is indeed a shame you did not keep it. Box fresh examples must be getting few and far between now. Was there a more washed-out yellow available on the standard 903cc car then? I once thrashed one of those from West Yorkshire to Edinburgh, picking up a couple of Aussie hitch hikers on the way. They started off quite chatty but soon went quiet. Whether this was due to my driving style (with three blokes, two large backpacks and my luggage on board, the car required a firm hand to make it accelerate and decelerate) or incessant smoking I do not know. Your comment about the Seicento exactly reflects my own thoughts about this car. The Cinquecento is crisp and sharp, while the Sei looks flabby and has a lot of unnecessarily added features. In a way, it’s an early example of how new car generations are made today. I remember looking at a Cinquecento in a Central London Fiat/Lancia dealer, back when something less than a Bentley dealer could afford London rents. It was a very tempting proposition but, in the end, I had to concede that I needed a bigger boot. Years later a Renaultsport Twingo tugged at the same strings. I wish I didn’t always need to carry stuff around. The Seicento was, effectively, a facelift and Fiat facelifts are inevitably disastrous. Whilst the Seicento did nothing to spark an interest, FIAT redeemed itself in my eyes with the later Panda 100HP. This was a car that I never sampled, but which was to a very similar, if slightly harder boiled, formula, which I’d have readily bought if it would have fitted with my needs of the time. I still find this much preferable to the current 500 Abarths (or 695 series, as they seem now to be called). I am a fan of the current Panda, to which FIAT has decided not to bless any kind of performance upgrade. The Panda remains close to its utilitatian and functional roots – albeit with a knowing theme applied. The 500 and it’s contrived brethren of misshapen MPV and SUV relatives are far too self-conscious caricatures of FIAT’s small car heritage. I can’t help feeling that the latter range will run out of road quite quickly, although sales still seem to be defying my logic. I too liked the look of the Panda 100hp. It seemed just the right amount of power – by which I mean not too much (actually I’d have called it the 99hp to make a point, but then I’m crap at marketing). I toyed with the idea, but my business partner already has a Panda and I thought that people might make jokes about the Panda Twins. OK, that’s not really the reason, again the boot was too small. Nice article – the first picture of the Cinquecento is very nice too ! At that time, my choice was a Citroen AX with the very new PSA TU engine. Very frugal and a lot of fun to drive. A serious point lurks there. Had the Italians not heard about ergonomics? By the 1970s the main points were known. Markus. I’m over 1.9m and I seemed to find the Cinquecento a comfortable fit in the showroom, though I didn’t drive it. In my youth I had a friend, slightly taller than me, who told me that, when he drove his girlfriend’s 500, the sunroof was essential, in the manner of your photo. Where there’s a will, there’s a way. A friend of mine is close to 2m tall, yet that couldn’t keep him from getting an S2 Lotus Esprit. Mind you, it wasn’t an affair that lasted very long, but it goes to illustrate his dedication. Vehicles I’ve tried to squeeze into are a Caterham, a Daihatsu Hijet and a Piaggio Ape. The Ape was the only one I would have real problems driving. Straight ahead would have been fine, but I don’t think I could have turned the bars at corners.